We were recently asked why we publish competition results which would seem to contradict our policy of urging consumers to drink what they like, not what others recommend. The short answer: I enjoy reading how east coast and midwestern wineries fare against West Coast wines. I hope you do too. Thus, here are results from the 2007 Pacific Rim Wine Competition and the 2007 Riverside International Wine Competition. The hobby struggled initially since selling wine in a small state, where 98% of the population doesn’t drink, was extremely difficult. And of the 2% that did drink, they preferred beer and liquor. But eventually advice from a UWV professor changed this situation. This professor told the Deal’s that their business model was flawed, instead of selling wine, Forks of Cheat sells gifts. Even if someone doesn’t drink, they know someone who does, so buy the wine as a gift. To facilitate this model, Eric has design award winning labels and custom labels for special occasions. The result, the winery now sells 2 dozen types of wine, and they just became the state’s third bonded distillery. After hearing Mr. Deal explain the tax situation, I wonder why they started the distillery. The Federal government taxes the whiskey based on bulk product and proof. Thus, if the liquor is 150%, then the feds tax it 1.5 times. Then the state taxes the wholesale product at 28%, and the retail tax is 11%. How will they make a profit? We will see because the liquor will finally be available by the end of this month. The brandy (Peach, Pear, Blackberry, Cherry and Apple) will have low alcohol levels, since they want to market the wine to older women, who prefer a less alcoholic brandy. And eventually Forks of Cheat will produce Grappa, made from the second fermentation of skins, stems, seeds, etc from the wine grapes. Even though Forks of Cheat is located just on the outskirts of Morgantown, it seems as if it is situated far into the countryside. The winery overlooks a small valley, with the vines planted on the sloped below. There are two decks; the larger surrounded by beautiful landscaping and Koi ponds. Even without today’s music, this is a great environment to share a glass of wine, relaxing in the sun or shade. Since it was a red wine tasting event, that’s all I drank. These wines included the viniferia Merlot and Cabernet Sauvignon and the hybrid DeChaunac, Chambourcin, Baco Noir, and Leon Millot based Burgundy as well as the sweet Van Buren. The Van Buren is similar to Concord and is one of the winery’s best sellers. I really enjoyed the hybrids; all are medium bodied wines with low tannins which provide a smooth finish. The Chambourcin is slightly spicier than the Baco Noir and Burgundy, but each had a unique, drinkable flavor. When visiting a winery, look for products that you normally do not have access to. Forks of Cheat produces plenty of these, such as their Niagara - Watson’s White Port, Bad Cat Catawba blush wine, the Baco Noir, DeChaunac, Leon Millot, and my favorite, the Foch – Black Jewel Port. And soon, you will have access to fruit liquor and Grappa. Quite a range of “gifts”. Before leaving Morgantown Jerry recommended I purchase a bottle of Mountain Moonshine, distilled by his friend and West Virginia’s first distillery, the West Virginia Distilling Company. The whiskey is a clear corn whiskey made from 20% corn and 80% neutral grains. The whiskey is very clean tasting, with a slight sweetness; but be prepared, this whisky is strong. On Saturday, May 19th, I decided to avoid the crowds congregating in Front Royal and Columbia and venture out to Maryland’s most western winery, Deep Creek Cellars. Located on the extreme panhandle, the winery is minutes from West Virginia, Pennsylvania, and Deep Creek Lake, the later which drives most traffic to the winery from its spring through autumn visitors. 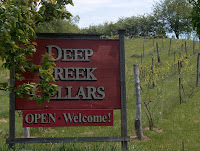 Deep Creek Cellars is owned and operated by Paul Roberts, who started the first vineyard in Garrett County in 1997, by planting Cabernet Franc and Vidal grapes. He also helps manage a second Garrett County vineyard grow Cabernet Franc, Chardonnay and Vidal. Mr. Roberts first started making home wine in the early 1990s after planting Cynthiana grapes in a leased plot in western Pennsylvania. He started from scratch, researching not only how to grow grapes, but how to operate a tractor, post a trellis, etc. After a few years making home wine, he searched for land to purchase to establish his own vineyard\winery. The result - Deep Creek Cellars. Over years, the winery has slowly gained a strong following and reputation and recently Baltimore Magazine selected it as the best Maryland winery. And now several Baltimore retail outlets carry large quantities of their wines. Mr. Roberts is not only a self-taught expert on wine-making and grape growing, but he is also a self taught expert on grape varietals. This is evident from reading his blog and his book, From This Hill, My Hand, Cynthiana's Wine . Published in 1999, the book describes his early experiences growing wine – up to - the creation of Deep Creek Cellars. Deep Creek Cellars offers two white wines, the Seyval-Chardonnay based Yellow Jacket White and the White Linen Reserve. Of the two, I preferred the later, which is a blend of estate & northern Virginia Vidal Blanc, southeastern Pennsylvania Seyval, and estate & California Chardonnay: three grapes from four appellations. The wine is dry, with a slight earthy flavor, the body and texture of a chardonnay and the slightly sweet-spiciness of a Vidal. This is a great blend, each grape complimenting the wine but not dominating it. On the other hand, while finishing the tasting, a patron entered specifically to purchase the Yellow Jacket White, describing it as her favorite wine. For reds, Deep Creek Cellars offers three very good, dry wines. The Artisan Red is your everyday value wine. It is predominately Grenache and Carignan, lightly oaked, and unfiltered. It is very fruit forward with berry flavors with a smooth finish. Priced at less than 10 dollars, this is a bargain. The next wine is the winery’s best seller and my favorite, the Watershed Red Reserve. Made from Cabernet France and small amounts of Zinfandel and Petit Verdot, this wine is a home run. The aromas are amazing, often I didn’t bother sipping, and I just wanted to smell the wine. Once I did try the wine, it was great; full-bodied and dry, yet soft and smooth. It has a fruit forward cherry flavor and a smooth, slightly vanilla-ish finish. Excellent. The next red was the Ursa Major, and equal blend of Virginia Cynthiana, California Zinfandel, and California Grenache. Mr. Roberts prefers blending Cynthiana instead of making a vintage Cynthiana wine, so he chose to use two American classic grapes with the Grenache. This blend is very interesting; bold cherry flavors with a spicy finish. As much as I love each of these grape varieties, I somehow think it’s overshadowed by the Watershed Red Reserve. Finally, Mr. Roberts offered me a glass of his upcoming Cabernet Franc Rose, which he plans to bottle this summer. The wine is an excellent dry rose; dry, but soft and refreshing. This wine will be versatile, drinkable alone or with a meal. Look for it this summer. The only downside to visiting Deep Creek Cellars is the distance, 2-3 hours from the Washington metro area. Once you reach western Maryland, there are plenty of other attractions from historic Cumberland, to Deep Creek Lake and the Youghiogheny River. Or, you could continue into West Virginia…. On Thursday, May 10th, we participated in the Bordeaux Wine Bureau’s second annual Today’s Bordeaux tasting of 100 “classic, contemporary, affordable wines”. This was a trade-only tasting designed to introduce distributors, retailers, and wine writers to 100 of the best Bordeaux wines that retail for less than $25. An independent jury selected the wines from over 300 wines entered. In addition, several of the winemakers were present to represent their wines and the region on behalf of the Conseil Interprofessionnel du Vin de Bordeaux (CIVB). Before attending this event, we were familiar with the high priced Bordeaux red wines that are often featured in Wine Spectator and other sources. We were a little skeptical that there were even Bordeaux wines available for less then $25. Were we ever wrong. In fact 80% of the wines produced in Bordeaux fall within this price range. Not only were the wines fantastic, but the majority were less than $15. Complete bargains - particularly when locally produced wines now cost more than $20. It was also fascinating listening to the winemakers discuss Bordeaux – the terrior: from the appellations to how elevation and location affects not only which grapes to grow, but what percentages to use in the blend. Fascinating stuff. The white wines were blends of Sauvignon Blanc, Sémillon, and sometimes Muscadelle. This grape has a similar aroma as the Muscat family of grapes, but is unrelated. And this aroma led us to prefer the blends with higher percentages of Muscadelle. Our favorite was the Chateau Lamothe De Haux 2006 – a blend of 40% Sémillon, 40% Sauvignon Blanc, and 20% Muscadelle from the Bordeaux appellation. The winemaker, Damien Chombart, explained that the Muscadelle is used for its excellent aroma, but it is a very fragile grape – prone to noble rot. The finished wine has flavors of kiwi and grapefruit. This wine retails between $12 and $14. Another white that we enjoyed was the Chateau Villa Bel-Air Blanc 2004 ($20), a blend of 45% Sémillon, 40% Sauvignon Blanc, and 5% Muscadelle. The best non-Muscadelle blends were the Saint Savin 2005 (60% Sémillon - 40% Sauvignon Blanc); the La Vigne D’Argent 2005 (75% Sauvignon Blanc - 25% Sémillon); and the Vieux Chateaux Gaubert 2005 (50% Sauvignon Blanc - 50% Sémillon). Fortunately, there was also dessert wine, an incredible Sauternes – the Castelnau de Suduiraut 2003 (90% Sémillon -10% Sauvignon Blanc). This wine just melted in your mouth and at $20 it is more affordable than ice wines or many late harvest wines. The red wines were either vintage Merlot, Cabernet Sauvignon, Cabernet Franc, or a blend of the three. In a few cases, a small percent of Petit Verdot or Malbec were added to the blend. Our favorite was the Chateau Taffard 2005, a 50-50 blend of Merlot and Cabernet Sauvignon from the Médoc appellation. Chateau Tafford has been operating for 163 years and ages this wine in stainless steel. The result: a full-bodied, dry wine, but the low tannins provide a long soft finish – very smooth. And at $12-$14, this is a bargain. Another excellent wine that is aged in stainless steel was the Roc de Jean Lys 2005 and blend of 70% Merlot and 30% Cabernet Franc. Aging in steel allows the grapes to speak for themselves; this wine is full of berry flavors and a balanced smooth finish. And its only $15. Another great wine was the Chateau Robin 2003 a blend of 60% Merlot, 30% Cabernet Sauvignon and 30% Cabernet Franc from the Cotes de Castillon appellation. This wine is aged one year in oak and is a balanced full-bodied wine. Jerome Caille, the wine maker, informed us that his goal is to produce a drinkable wine with low sulfates. If the wine is made carefully with quality fruit, sulfites are unnecessary. Although I’d like to discuss all the wines, the last I must mention was the 2005 FreeRange Red Bordeaux another 60% Merlot, 30% Cabernet Sauvignon and 30% Cabernet Franc blend. Produced by the JuiceBox Wine Company, the Red Bordeaux is one of seven Bordeaux wines available, by; yes; a 3-liter box. First, the wine is excellent; otherwise it would not have been selected to participate in the tasting. Second, it is incredibly affordable – priced at $27 a box – this converts to $6.75 a bottle. Finally, the process is simple. Eric Delong, a fifth generation Bordeaux winemaker searches the area for outstanding wines from small producers. The wines are blended and packaged in France, then shipped to the states. We will have several available at our next family cookout. We left the Today’s Bordeaux tasting completely infatuated with the wines and winemakers. Bordeaux is not the home of stuffy, high priced wines; but friendly and affordable ones. We strongly recommend visiting the Bordeaux Wine Bureau and trying one of the 100. Traditionally, grapes are cultivated in each region based on geographic conditions, and not necessarily on which wine is is most popular in the market. In this regard, American winemakers in the southeast and Gulf states have been limited in the grapes that they can cultivate because the humid conditions of their terrior promote the development of Pierce's disease. Vitis Viniferia grapes are particularly susceptible to this disease, in which bacteria attacks the "water conducting" elements of the vines (xylem). Thus wine growers in this region were primarily dependent on growing native Muscadine grapes, which were mostly resistant to the disease. Researchers at the University of Florida’s Leesburg Research Station, began a program to create a new grape that was fully resistant to Pierce's disease. Led by Dr. John Mortenson, in 1968, the team was able to develop a complex hybrid grape from crossing a Florida-developed muscadine hybrid with the Cardinal (a Vinifera hybrid) table grape. They called this new white grape Blanc Du Bois, and claimed that is was completely resistant to the destructive disease. For the past two decades, southern winemakers have validated this claim by producing dry, fruity Blanc Du Bois wines, many which have won medals in international competitions. Although Florida was it's original birthplace, this grape has flourished in other humid regions in the United States, particularly in Texas. Tehuacana Creek Vineyards and Winery is a family owned and operated vineyard located in Waco, Texas. They are pleased to be able to produce a unique and premium white wine such as Blanc du Bois without having to produce “yet another Chardonnay”. Their Blanc du Bois is aged in stainless steel which gives the wine a crisper and livelier fruit taste which further distinguishes it from classic American whites. According to the winery, their Blanc du Bois combines the crisp fruit of a Riesling with the aromatic flavors of a Muscato and a touch of spiciness reminiscent of a Gewürtztraminer. It has also received a welcome reception from the Texan wine public by earning accolades at this year's Annual Heart of Texas Wine and Food Festival. Ulf Westblom, the winery’s Winemaker, also recommends aging the wine for several years – unlike other white wines, Blanc du Bois will further develop in the bottle. Traveling east into Louisiana, Landry Vineyards has been cultivating Blanc Du Bois since the vineyards were first planted in 1999. Located in the town of Folsom, in St. Tammany Parish, the winery seeks to produce quality Louisiana wines that are distinctive to the region and Blanc Du Bois meets this criteria based on its resistance to Pierce disease, its tolerance to heat and its ability to produce quality wine. Landry Vineyards produces three versions of the wine: Blanc Du Bois Dry, Blanc Du Bois Oak Aged, and Blanc Du Bois Semi-Sweet. According to the winery’s tasting notes, “each version possesses clean crisp flavors of fruit including peach, pear, tropical fruit with hints of wood character and honey-suckle aromas”. Jeff Landry, the owner/winemaker, believes this grape produces a nice wine and is excited about their current success producing Blanc Du Bois. Blanc du Bois will never receive the public exposure as Chardonnay or Riesling. But its worth a try. We are quite a bit behind schedule posting competition results, one of which was the 2006 Jefferson Cup. "The Jefferson Cup Invitational, a seven-year-old wine competition, is the only competition that honors the best of the best among US wineries from all of America’s wine regions. Each year we select great wines from across America. This year, at the end of the second day of tasting, December 1 st, 2006, wines from seven different states had captured top honors. Just as the event’s namesake would have it, democracy reigned at this year’s Jefferson Cup Wine Competition. The Jefferson Cup Invitational does not award golds, silvers and the like. Rather, the invited wines have all proven their excellence in competitions and tastings throughout the last year. We believe and try to publicize our belief that these are wines that are extremely deserving of the nation’s attention. This year, out of four hundred ninety-nine chosen wines, the judges chose just over two hundred thirty-six wines to receive the “Certificate of American Merit”, which respects wines exemplary of their regions and varieties. Next the judges chose ninety wines (there was no pre-ordained number or percentage) that they believed were truly great examples. Those will receive certificates announcing them as “American Examples of Greatness”. This year, sixty-seven wines were selected as Jefferson Cup honorees; these wines were nominated by the four judging committees to receive Jefferson Cups. Out of those sixty-seven honored wines, the judges picked nineteen wines to be awarded the Jefferson Cups. By selecting both vinifera and non-vinifera wines for the Jefferson Cup each year, the hope is to respect the diversity of American viticulture and Jefferson's own acceptance of native varieties and hybrids. For the first time, the judges chose to honor three of the Jefferson Cup nominees with a new, top award called THE JEFFERSON TROPHY." Courtesy of the 2006 Jefferson Cup. The first Maryland wine festival of the year will take place May 19th and 20th in Columbia's Symphony Woods, adjacent to Merriweather Post Pavilion. Last year's festival was attended by record crowds whcih lead to long lines at the tasting tents. We recommend arriving early and once the lines form, select a few wineries that you haven't experienced before. Basignani Winery, Boordy Vineyards, Cove Point Winery, Cygnus Wine Cellars, Deep Creek Cellars, Elk Run Vineyards, Fiore Winery, Frederick Cellars, Fridays Creek Winery, Linganore Wine Cellars, Little Ashby Vineyards, Loew Vineyards, Penn Oaks Winery, Solomons Island Winery, Sugarloaf Mountain Vineyard, St. Michaels Winery, Tilmon's Island Winery, Woodhall Wine Cellars. The first winery we plan to visit is Fridays Creek Winery, a new winery located in southern Maryland. We look forward to trying this winery's wide array of wines from Gewürztraminer and Riesling to Syrah and old Vine Zinfandel. Sugar Loaf Mountain is also a relatively new winery that you shouldn't miss. We will then stop by Deep Creek Cellars, the farthest winery from the Washington DC area. This is usually our only chance to taste their wines and we hope their Ursa Major (5% Cynthiana, 35% Zinfandel, 30% Grenache blend) will be available. After that, we will see which tent has the shortest lines. In the last two years Linganore Cellars and Frederick Cellars have won the Governors Cup for their Merlot and Cabernet Sauvignon - so they are both worth visits. Fiore Winery makes excellent Chambourcin, Loew Vineyards Chardonnay, Basignani Winery's Marisa (Foch, Chambourcin and Chancelor), Solomons Island Winery's Marytage, and Woodhall Wine Cellars' Cabernet. Plus, Penn Oaks Winery makes several excellent whites from German grapes and all the wines from Elk Run Vineyards are worth trying. You make the call. As for entertainment, your best bet Saturday is to see the boogie blues of the Daryl Davis Band. He learned the piano from the great Pinetop Perkins and always performs a great show. On Sunday, don't miss Charles 'Big Daddy' Stallings. Stalling's most recent hit "4x4 Woman" reached #1 @ XM Radio (Bluesville). Besides a wide variety of craft vendors, the festival will provide wine demonstrations each day. At 1:00 pm - Yogi Barrett, Wayne Peppers and Paul Bresson of the Tasters Guild International, will guide you through the wine tasting experience. At 2:00 pm - Maryland’s White Wines will be introduced by Yogi Barrett, Wayne Peppers and Paul Bresson. At 3:00 pm - Maryland’s Red Wines will be introduced by Yogi Barrett, Wayne Peppers and Paul Bresson. And at 4:00 pm - Maryland’s Sweet and Dessert Wines will be introduced by Yogi Barrett, Wayne Peppers and Paul Bresson. 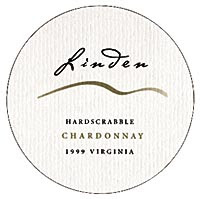 Over the past three years we had heard several Virginia wine enthusiasts recommend a visit to Linden Vineyards. We were told that the winery provided excellent views of the surrounding hillsides and that the wine was some of the best produced in the state. We had previously tasted their Hardscrabble Chardonnay – and were instant fans - and were eager to try their other offerings. Linden is located just off Route 66 close to Front Royal – about 40 minutes from the Beltway. Once you exit Route 66 and reach Linden the trip is an enjoyable, twisting ride among cattle and horse farms. The winery, itself, sits on a hill with awesome views of the surrounding hills. The rumors were apparently true. Over 25 years ago, Jim Law accepted his first job as a Virginian winemaker and eventually purchased the abandoned Hardscrabble Farm on the Blue Ridge Mountains. Through the years he increased his land holding so that currently all grapes used in Linden wines are grown in the mountains surrounding the winery. These vineyards now include the original Hardscrabble Vineyard, plus the Avenius and Boisseau vineyards. Linden Vineyards provides a free tasting of several wines and a $12 reserve tasting on the weekends. Today we skipped the reserve tasting because of time constraints and participated in tasting their 2005 Seyval, 2006 Rosé, 2005 Cabernet Franc, 2003 Claret, and 2006 Vidal-Riesling. The 2005 Seyval is a dry wine with a strong grapefruit flavor and a slightly acidic finish. The 2006 Rosé is a blend of Cabernet Franc, Cabernet Sauvignon, and Merlot, made with minimal skin contact. This wine is also made dry which is a welcome change from the many sweeter Rosé styled wines on the market. The wine also has a nice berry flavor and a slightly grapefruit flavor finish. Interesting. Moving to their reds, the 2005 Cabernet Franc is outstanding. It is a full-bodied, dry wine with a cherry flavor and spicy finish. This is another example of the excellent Cabernet Franc made in Virginia. Their other red is the softer 2003 Claret, a blend of Cabernet Franc, Cabernet Sauvignon, and Petit Verdot. The wine is medium bodied with berry flavors and a completely smooth finish. Finally, the 2006 Vidal-Riesling was a bomb – that is – a mouthful of acidity and citrus that moved throughout your mouth. Here is your summer wine; slightly sweet with spicy flavors. This is the one we took home. It was satisfying to validate the many claims we had received regarding Linden’s wines. And we enjoyed “hanging out” on their deck, talking with other patrons about Linden and the Virginia wine industry. We are looking forward to our return visit and a trip into the reserve cellar.